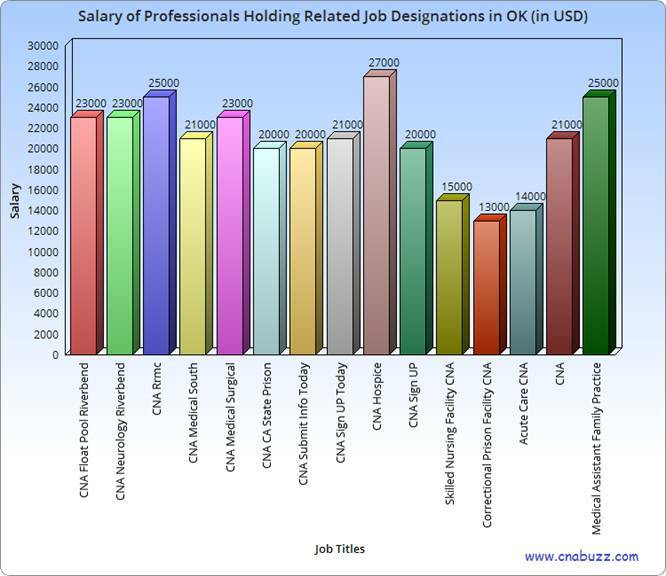 Work experience, education level, and location are some of the major factors that decide CNA salary in Oklahoma. According to the Bureau of Labor Statistics, around 17,270 certified nursing assistants were employed in the state of Oklahoma, as of May 2013, and earned the mean annual and hourly salary of $21,820 and $10.49, respectively. The employment per thousand jobs was 11.08. As per the survey conducted by indeed.com, it was revealed that the annual salary of a CNA was $21,000 in January 2015. It was 14 percent lower than the average salary for job postings all over the country. 90% of nurse aides received less than $28,460; 10% were paid more than $28,460. 75% of certified nurse assistants made less than $24,030; 25% earned more than $24,030. 50% of the employees were offered less than $21,490; rest 50% waged more than $21,490. 25% of CNAs were paid annual wages less than $18,750; remaining 75% were paid more than $18,750. 10% of employees were salaried less than $16,720; 90% were remunerated more than $16,720. The workplace plays a major role in determining the salary of a certified nursing assistant. 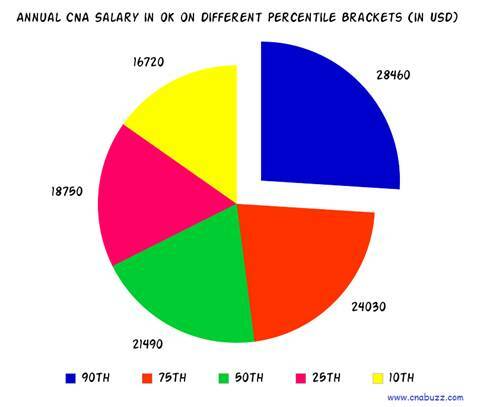 According to salary.com (as of January 2015), Broken Arrow and Tulsa remunerated CNAs with the highest salary ($29,238), whereas CNAs in Muskogee received the lowest median annual and monthly salary of $24,843 and $2,070 respectively. The median hourly wages ranged between $12 and $14. With the advancement in education, applicants now have the opportunity to acquire higher job titles. It not only brings more responsibilities but increases the salary figures of a CNA. For instance, as per the data provided by indeed.com, CNA Hospice earned $27,000, while Correctional Prison Facility CNA made the lowest ($13,000). Apart from the high salary, certified nursing assistants also enjoy a wide number of extra benefits. The growth rate of CNAs is predicted to be over 21 percent in the years 2012-2022, which means that approximately 312,200 new positions will be available to the nursing aides. However, this growth may be constrained by a number of factors such as reliance of nursing homes on government funding, limited options for career advancement, high physical demands, low income, etc. Question 1 – Is there any difference in the hourly salaries among various cities of OK? Answer – The hourly salary in the state of Oklahoma ranges from $12 to $14. However, maximum cities provided an hourly salary of $14 to the CNAs. Question 2 – Currently, I’m living in Atlus and earn an annual salary of $25,808 as a CNA. I’m planning to shift to Broken Arrow, how much salary can I expect there? Answer – Atlus is one such city that offers the lowest annual salary to a CNA. In Broken Arrow, nursing assistants can earn up to $29,238 per annum.